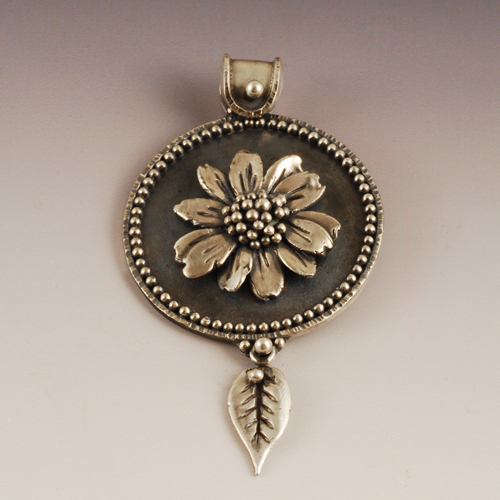 One of the wonderful possibilities with Argentium silver is the possibility to do fused granulation. This ancient decorative technique is typically executed in 22K gold. According to Ronda Coryell, Argentium behaves much more like 22K gold than like traditional sterling silver. For my Sunflower pendant, I combined a simple round base with a granulation border with a fine silver sunflower and granulated Argentium flower center. The leaf drop is also metal clay. I like this sunflower a lot.